We take great care to ensure that every repair meets our standards for quality. The labor performed by us is guaranteed against any defect in workmanship for as long as you own your car. Limited Lifetime Warranty on metalwork. Limited Lifetime Warranty on paint, stripes and decals. 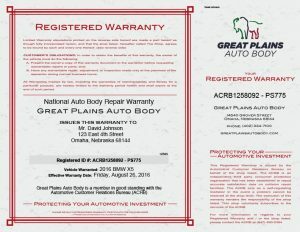 One Year Limited Lifetime Warranty on mechanical repairs. 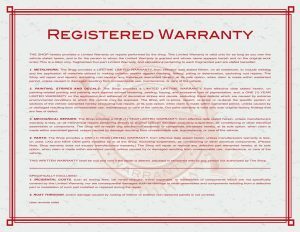 One Year Limited Lifetime Warranty on parts (does not exceed mfg. warranty).